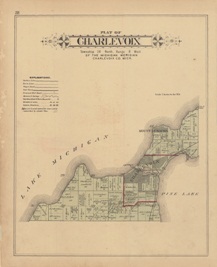 The Charlevoix County 1901 Plat Book, a beautiful historical piece, full of interesting tidbits of information about properties, is now available digitally. Digitization was made possible through a generous donation by the Friends of the Charlevoix Public Library. The scanning work was completed locally, by Village Graphics. Note: The maps from the plat book are labeled and listed below. Each item is a link that will connect you to a scanned image of the map located within our Flickr account. After opening the desired map you can select a larger or smaller image of the map and also have the option to download the image to your computer.